I got so distracted with planning TEAM TLC that I forgot to blog about TLC Tysons Corner officially sponsoring the Joe Cassella 5K Run/Walk. This is the fourth year that TLC Tysons Corner has sponsored the event by donating an auction item: a refractive surgery procedure! And, this is the first year that we've been able to put together enough runners/walkers to have a team. So excited! Last year's event raised about $50,000 for a child fighting cancer. When a child has to face such challenges in life, it affects the child and the entire family. Medical costs can add undo strain to the family's financial budget, so it's wonderful when a foundation like the Joe Cassella Foundation can help these families in their time of need. Let's do everything we can to make this year's event even better than 2012's race. Please help us support the Joe Cassella 5K by joining TEAM TLC. We have to beat Team MyEyeDr.! WHO: Anyone interested in having some fun. If you don't want to walk/run, you can volunteer. WHAT: 5K run/walk with prizes for multiple age categories. Benefiting children with medical needs. WHEN: Hopefully a beautiful Sunday, May 19, 2013, at 8:30 a.m.
HOW: Join our team. Make a donation. Put on your racing shoes. Bring your dog. Hit the pavement or a volunteer station. Feel good about yourself because you will be helping others. 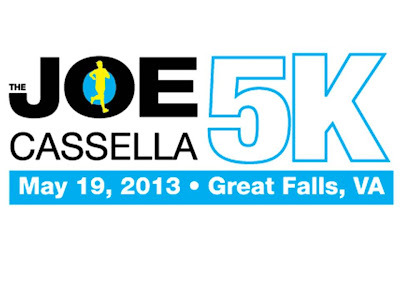 Click here to get more information on how you can help with the Joe Cassella 5K Race/Run.